When little Vedant Balasaheb Darade hailing from Latur was in preparatory school, he developed severe body rashes all over his body, referred to as Stevens-Johnson Syndrome, resulting from a medication that was given to him for fever. This damaged his cornea and fused his melted eyelids. When local doctors failed to treat the problem, he was advised to seek treatment at LVPEI, Hyderabad. Dr Bhupesh Bagga reassured the parents that there was still hope and all vision was not lost. A two-step surgical treatment to first cover the cornea with amniotic membrane was followed up a couple of months later by mucous membrane graft, where the inner skin from the lower lip was tacked onto the inner eyelids to allow the eyes to open and shut smoothly. 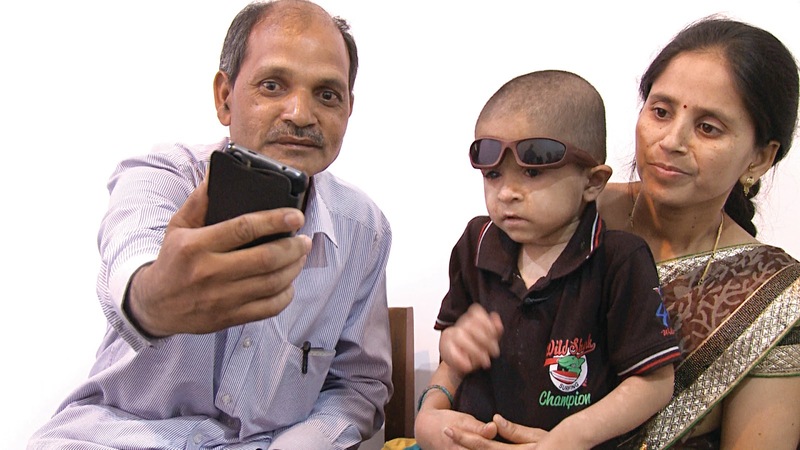 Six months later when Vedant came for a follow up check with vision restored in both his eyes, it was a sight to see him running across the corridors, singing rhymes and reading numbers and alphabets on his father’s mobile. “I have seen God in the form of Dr Bhupesh Bagga. With my son’s vision restored I am relieved now and hopeful of a bright future for him. Owing to my financial condition, the surgery was provided free of cost. I wonder what we would have done, if LVPEI was not there for us,” says the teary eyed father Mr Balasaheb Darade.